Manning has compiled a 500–236 record and nine NCAA tournament appearances in 29 seasons as head coach of women’s basketball. Photo courtesy of Sports Information. Pat Manning didn’t think anyone knew. She was aware that her daughter and her assistants knew, but otherwise, the head coach of women’s basketball was focused on the task at hand: a conference game against Colby. Friday’s matchup with the Mules, however, was not just any conference game for Manning and the Ephs. At the final buzzer of a 58-34 victory, Manning became the 22nd coach in Div. 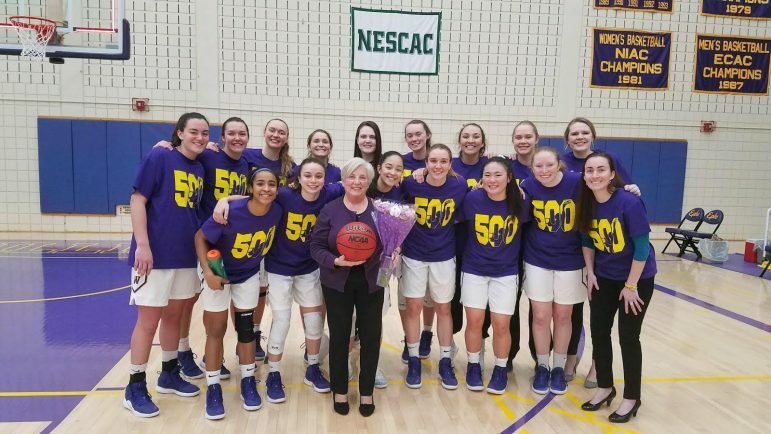 III women’s basketball history to record 500 career wins. After exchanging handshakes with the Mules, Manning shared a moment with her assistants and hugged members of her family in attendance as her team jogged into the locker room. Manning soon followed, exiting Chandler Gymnasium through the usual side door. Seconds later, the team burst through the same side door and ran back onto the court, clad in purple T-shirts with the No. 500 emblazoned in gold on the front. The design also included a silhouette of Manning cutting down a basketball net. As the crowd stood and applauded, Manning waved and posed for pictures at midcourt with her team. Everybody knew. “It’s been a thrill to coach here for 29 years, and I’m ready for 29 more,” Manning said. Mesaris, who shared a similar experience with her coach in college and wanted a special way to acknowledge Manning’s achievement, collaborated with Nick Giard, assistant coach of men’s basketball, to design the commemorative shirts. “The women on the team have had them with them for a couple games in anticipation of the victory,” Mesaris said. With the team returning from a four-game road trip, a home contest with Colby on Friday night seemed like the perfect opportunity to reach the milestone. Manning, who began the season with 490 wins, had notched her 499th victory on Jan. 25 in an away game against Trinity. With the chance to make history on their home court, the Ephs seized the moment and raced ahead to a 16-3 lead over the Mules in the first quarter. Team defense, which Manning emphasized during preseason, made the difference early on for the women as Colby committed 9 turnovers and settled for many well-contested shots. On offense, Maggie Meehan ’21, the team’s leading scorer on the season, pushed the pace of the game. Meehan scored two baskets in transition in the first quarter, including a coast-to-coast driving layup through contact. Although the women never trailed, Colby edged back into the game in the second quarter, pulling to within 6 points on a 3-pointer by Jackie Albanese. With the Mules holding all the momentum, Morgan Dauk ’21 came off the bench and quickly responded with a 3-pointer of her own. Dauk, who finished with a game-high 17 points, continued to power the Ephs for the rest of the night. With her head coach pacing the sidelines and clapping, Dauk delivered an extremely efficient performance, shooting 6 of 9 from the field and 3 of 4 from the foul line in 16 minutes. As the women extended their lead, Mikaela Topper ’21 also crossed into double figures, draining two jump shots and a layup in the fourth quarter. Topper walked away with 13 points on 6-for-12 shooting, 3 assists, 2 rebounds and 2 steals. After the game, Manning commended the performances of Meehan, Dauk and Topper as well as the defense of Gabby Martin ’21. With the historic victory, Manning improved her all-time tally to 500–236, a .680 winning percentage. Her teams have reached the NCAA tournament nine times, including trips to the Sweet Sixteen in 1999, 2006, 2010 and 2013. In 2013, the Ephs compiled a program-best 27–6 record under Manning’s leadership. The women advanced to their first Final Four and placed third in the nation, defeating none other than rival Amherst in the third-place game by a score of 57-53. Off the court, Manning is active in the Women’s Basketball Coaches Association, a national organization of coaches at all levels. In particular, she has been instrumental in the creation of a Div. III women’s basketball all-star game. The inaugural event will be held on March 16 at Roanoke College in Salem, Va.